Palomino Blackwing Pencils have been on my need-to-try list for a very long time. I just keep holding out on not buying them because they are significantly more expensive compared to other pencils. A box of 12 pencils on Amazon cost US $24.95. Just for comparison, a 12-pencil box set of Mitsubishi Hi-Uni and Staedtler Mars are both $10 less, or half the price. They are all pencils, so what's the difference? These are the three pencils that I bought online. They are the Blackwing Pearl (white), Blackwing (black) and Blackwing 602 (gray). I just wanted to try out one from each type rather than get a whole box of them. There are also many other versions of Blackwing pencils out there. The more common ones are the regular, Pearl and 602. These are hexagonal bodies. The graphic core is encased with Cedar wood. When you sharpen the pencil, the wood shavings will remain intact as one piece. These feel nice to hold in hand, but I can say that for all wooden pencils too. Blackwing pencils are longer compared to other wooden pencils because of the metal ferrule behind. 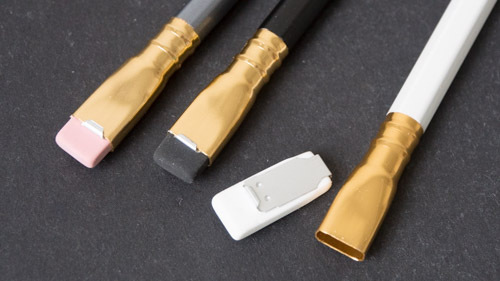 The gold-coloured metal ferrule looks really classy and lends a premium feel to the pencils. Maybe that's why the company can charge higher for these pencils. The eraser is replaceable so you can swap them out when they are worn out. 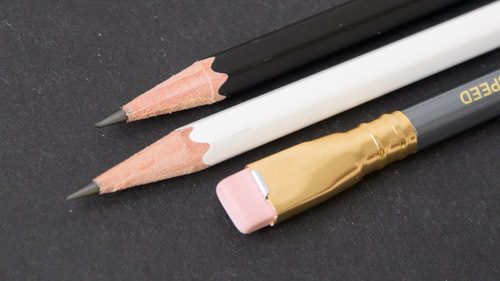 The regular Blackwing comes with the black eraser, Pearl has the white eraser, and 602 has the pink one. The hardness of the graphic is not labeled on the pencil. The regular black one has the softest graphite which is probably a 4B. Blackwing Pearl has slightly harder graphite at maybe 2B. Blackwing 602 has the hardest of the three, which is actually also quite similar to 2B. For drawing purposes, the regular and Pearl are more suitable for shading. For line art, the harder Blackwing 602 is more suitable. And on the back of Blackwing 602, it says "“Half the Pressure, Twice the Speed”. 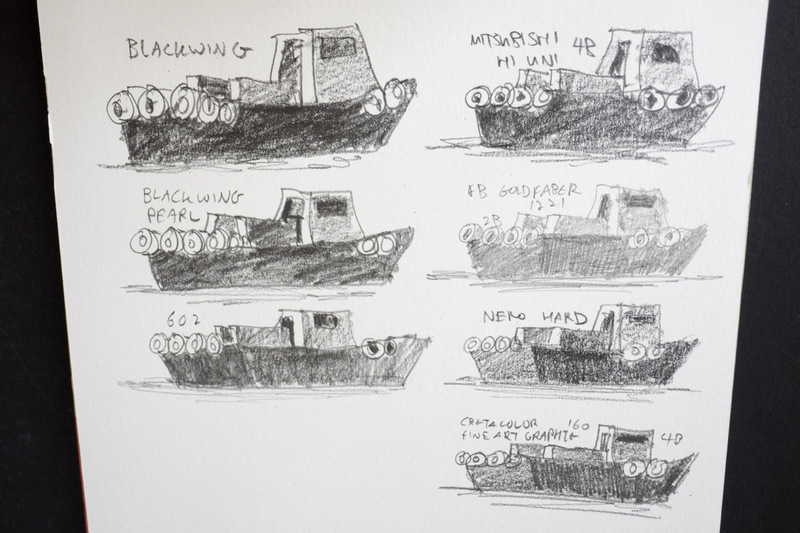 If I can only choose one Blackwing to buy, I would get the one in the middle, Blackwing Pearl. Above are some shading and line art test compared to other pencils that I have. Blackwing pencils are good quality pencils. When compared to other good quality pencils, the quality is quite similar. So when you're paying more for these pencils, you're really paying for the brand and also the eraser thing. They may be expensive, but if you're someone who goes through just one pencil a month, then it may not be that expensive in the long run. However if you're someone who uses up pencils frequently, cheaper pencils will definitely save you money. Do you use them? Do you like them? Or what pencils do you use? Which are your favourites? Let me know in the comments section before. Amazon.com | Amazon.ca | Amazon.co.uk | Amazon.de | Amazon.fr | Amazon.es | Amazon.it | Amazon.co.jp | Amazon.com.au. The pencils may be available on Jackson's Art Supplies (UK) too. I've been using Blackwing 602 occasionally and I really enjoy it. These pencils were popular way back as it was mostly used by animators working on paper 2d animation. As an animator and illustrator myself, I did try it due to curiosity and loved it. 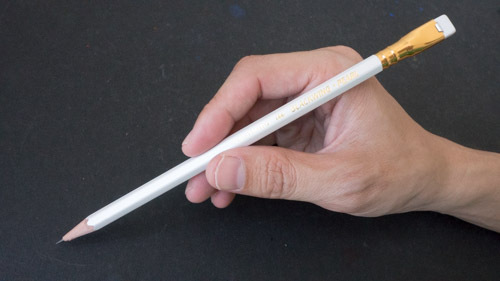 It is comparatively expensive than other regular pencils, but the quality and strokes are great. The Palominos were those that gave the muddier results on your comparison sketches. This is not a sign of particularly good quality of graphite leads . I would expect better results especially on that price range. The large eraser on the back will probably affect the balance of the pencil and will not allow to use pencil extenders.